More cities, towns, and villages, especially in Khuzestan Province, southwest Iran, are reporting flood conditions on Tuesday and locals are complaining of receiving no state relief. Floodwaters are making road conditions very dangerous. A bus has reportedly tipped over on the Ahvaz-Shush road as the driver could not see the road due to rising water. 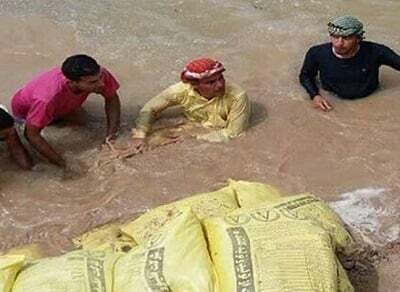 People in many villages across the province of Khuzestan are engulfed by floodwaters. Locals are awake all night and desperately asking for help. esidents of all cities, towns, and villages are emphasizing they have not received any support from local, provincial or government authorities. Youths in many villages are taking matters into their own hands, erecting and repairing floodgates to protect their homes and farms. It has become crystal clear for these locals that the government has no intention of providing the support they desperately need.